Start up costs for any homesteader, farmer, or backyard farmer can be high! Fences, shelters, food dishes, milking supplies, minerals, oyster shell, grit, hoof trimmers, and on and on it goes. So is there ways to cut costs without cutting corners? Yes. 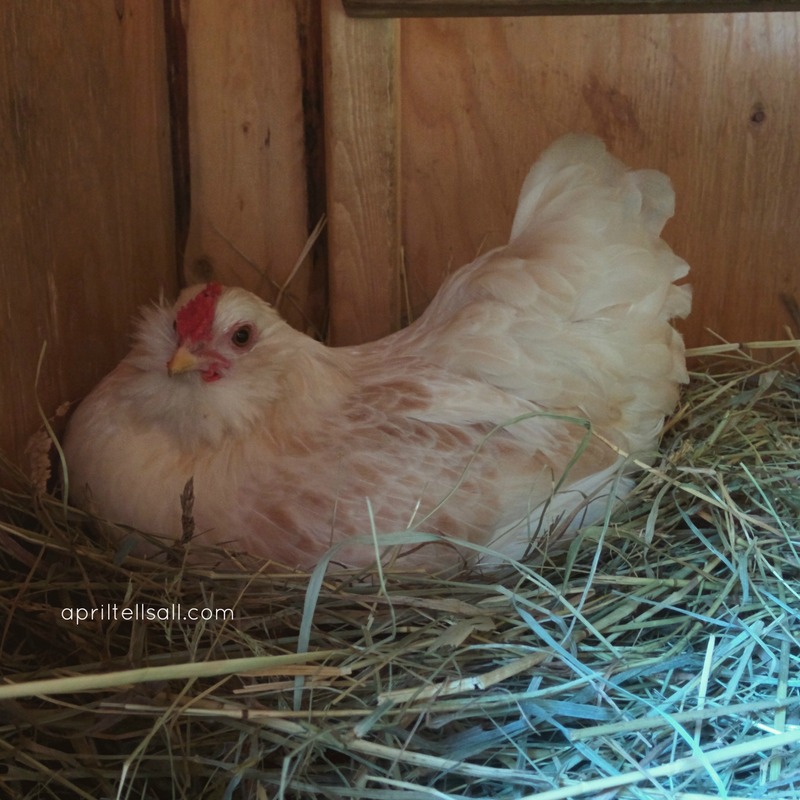 Here’s a few ways we’ve saved money on our little backyard farm. Cedar posts are expensive! Which is sort of odd to me since cedar trees are so abundant, at least around here. To save money on fence posts we just cut down our own trees. We only have 1 cedar tree on our property so we left it alone, but when clearing out some of the bush any time we came across a fairly straight log it was put aside to be used as a fence post. The majority of our fence posts are pine logs. We were able to fence both of our paddocks without buying a single post. The cost: time and gas for the chainsaw. A single (good sized) chicken feeder can put you back $40 or more! 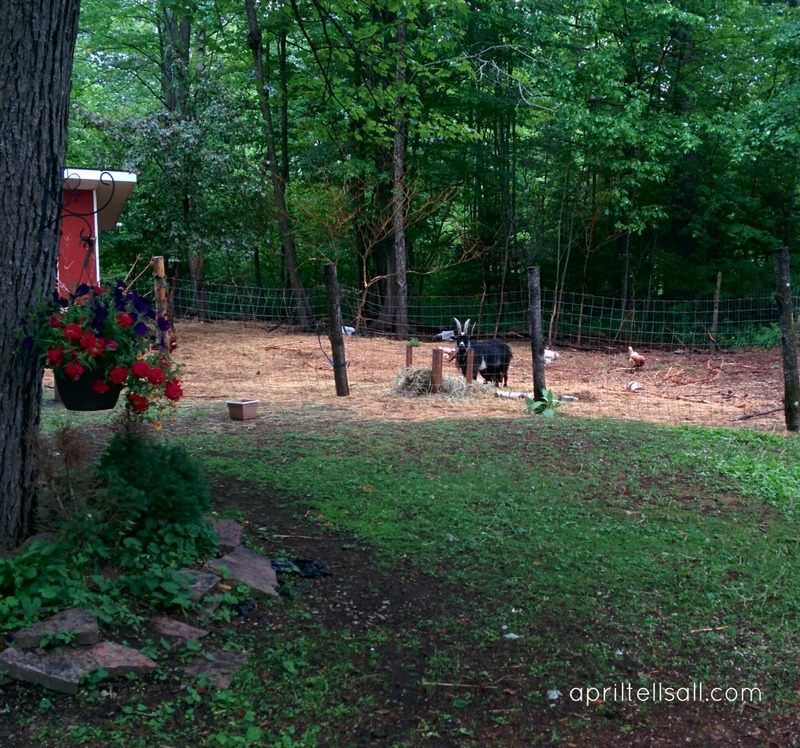 Our chickens and goats share a paddock which means I don’t free feed my chickens. Chicken food is bad for goats but like any child with candy, a goat will devour chicken food until it makes itself sick. Our chickens are fed first thing in the morning, before the goats are let out for the day, and in the evening when they’re let out of the paddock to free range. For chicken food dishes we use large plastic picnic bowls that I bought from the dollar store. They can be knocked over easily so if they’re going to be in the coop 24/7 I’d suggest screwing them to a board, or something heavy to keep them in place. I have 4 – 2 per coop. Cost: $3 each or $12 total. For the goat dishes, I bought dog food bowls from the dollar store. I use them for giving the goats their grain and alfalfa pellets in the morning. I have 5 of them. Cost: $2 each. 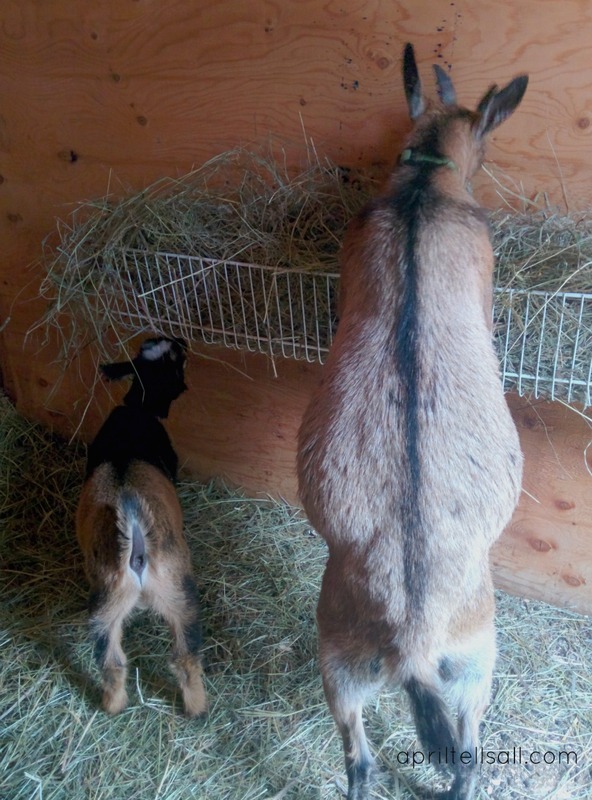 The goats also get free choice hay during the day. I prefer to have the hay off the ground. To do this we have used a bent rubber maid shelf screwed to the paddock wall. One of goat stalls is built out of wooden pallets. 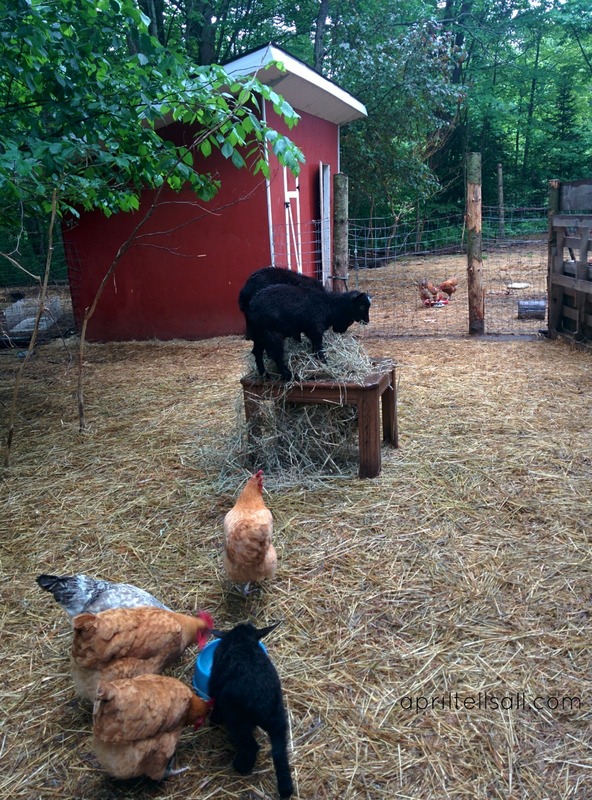 The gaps in a wooden pallet is perfect for stuffing with hay. I also got 2 end tables that a family member was throwing away. They’re the kind that is supposed to have glass on the top. They work perfectly for holding hay out in the paddock (glass removed of course). Cost for hay feeders: $0. All items were being thrown away, so they cost us nothing. For water buckets, I just got some old buckets from work. Most bakery’s will have buckets from icings, fillings, or batter mixes that they will give you for free or for a small price. All of our water buckets I have gotten from there as well as the bucket that I sit on when milking the goats. Cost: $0. 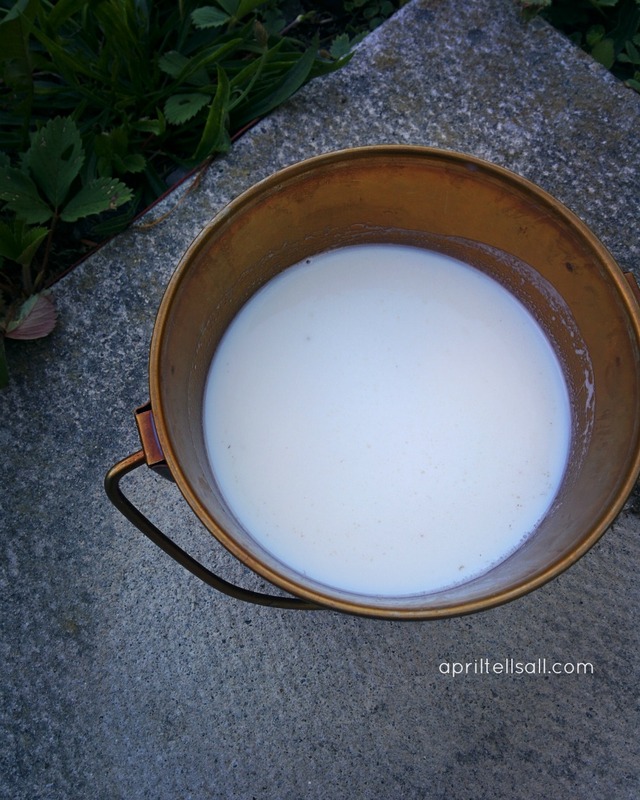 I use a reusable coffee filter to filter the milk. I use the cone shaped one because the flat one has a plastic bottom and it’s hard to strain the milk through it. The cone shaped one also fits well in a measuring cup so I can keep track of the milk I get each day. I bought this at the dollar store. Cost: $2. A lot of chicken keepers or chicken websites will tell you you have to feed oyster shell to keep your hens healthy. This isn’t true. Hens do need a source of calcium so they can keep laying eggs with good strong shells, but you don’t have to spend money on this. Simply reuse your egg shells! We have never had a hen start eating the eggs after feeding egg shells, but we take a few extra minutes to prepare the egg shells properly. Here is how to prepare them. 5. Grit is it really needed? Grit was something I was super worried about when I first got chickens. The general rule is when they are babies as long as you feed them just chick crumble they will be fine. If you want to start giving them treats or kitchen scrapes at a young age, you do need to provide grit, but again, you don’t need to buy it. Chickens don’t have teeth, so they use grit or tiny little pebbles and rocks to grind their food for them. This happens in the gizzard. Free ranging chickens can pick up pebbles and rocks as they forage for food, which means you don’t have to provide them with grit. If they’re babies and still in the brooder area, you can give them dirt from your yard to dig through. The only time I provide grit is in the winter time when we are buried in 5 feet of snow. A bag of grit is $17.00 at my feed store and I go through a bag every 2 1/2 years. The next big expense you will face if you have dairy goats is a milk stand. There are a few places to buy them, but it will cost you way less to make one, especially if you scrounge around for materials. Hubby built my milk stand from an old coffee table (that went with the end tables that are now hay feeders), and a part of a wooden pallet to make the head lock. We screwed an old bucket to the front to hold the grain, and voila! A milk stand. I sit on an old upside bucket that I got for free from the bakery. Cost: $0. 7. Scrounge for as much as you can. Last year my chickens ate all of my tomatoes, dug up my bean plants, and demolished all of my lemon cucumbers. It became very apparent that we needed to fence in the garden, but didn’t have the money laying around for fencing at the time. Lucky for us, at the same time a neighbor was pulling out fencing from his yard. 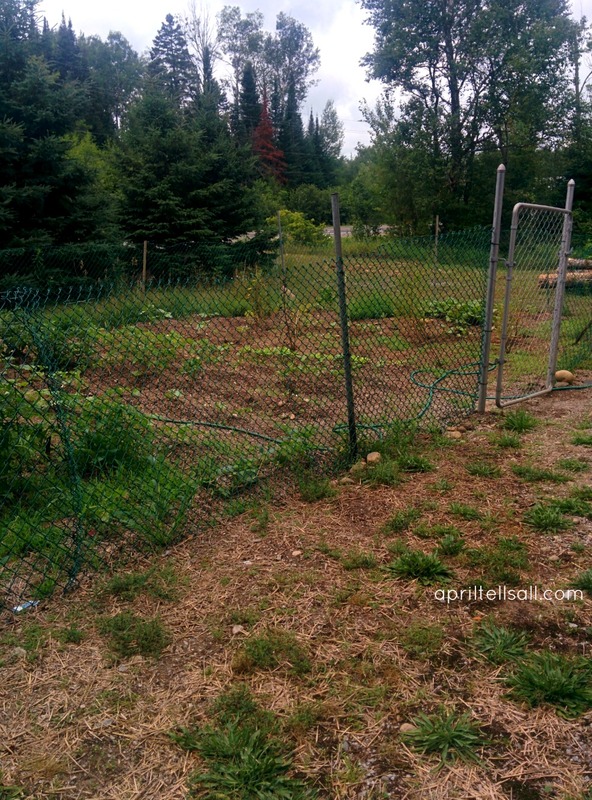 We were able to fence the entire garden for free with his old fence. It isn’t the most beautiful, but it sure does do the job. The tomatoes will be mine this year! Those are just a few of the ways we try to save money on the farmstead. The start up costs are always the worst, but the freshness of the food makes it all worth it. For real. Interested in knowing how much it costs us to grow our own food? This post literally tells it all. What have I missed? 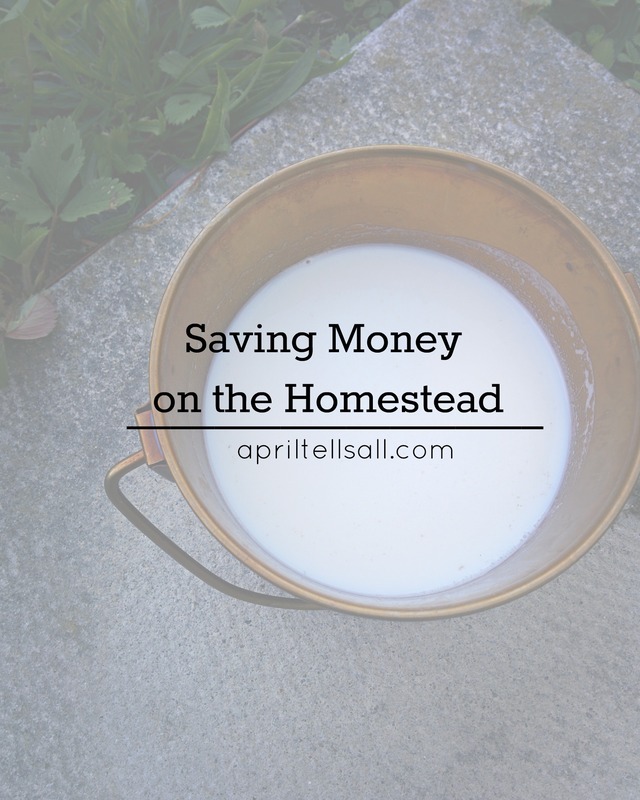 How do you save money on the homestead? ***This post contains affiliate links. If you should choose to purchase something from these links it will cost you nothing extra, but will give us a small commission to help support this blog. Thank you!